Mizner Court is a luxury waterfront condominium building located within Mizner Village on the grounds of the renowned Boca Raton Resort & Club. Originally built in 1988, this five-story, W-shaped building is home to 200 luxury condos overlooking the crystal blue waters of the Intracoastal Waterway & Lake Boca Raton. With an extensive list of world-class amenities, lavish condominium residences, and a prestigious waterfront location, Mizner Court offers exclusive luxury condo living in Boca Raton at its finest. Mizner Court offers two- to three-bedroom condominiums which range from about 1,500 to 2,700 square feet of living space. Most residences offer spectacular views of the Intracoastal Waterway from every room, as well as views of Downtown Boca Raton and the surrounding tropical landscape. Mizner Court condos feature vaulted ceilings, hurricane shutters, in-unit washers and dryers, walk-in closets, French doors and gourmet kitchens with granite countertops and stainless steel appliances. Amenities include ocean access with no fixed bridges, 24-hour manned gated security, 2 pools, 4 outdoor spas, 2 tennis courts, sauna, and a fitness center. There is also a multi-story lobby with a glass elevator, social party rooms, card room, clubhouse, library, storage, and on-site manager. Mizner Court is a pet-friendly building and leasing is permitted with some restrictions. Residents also have membership options available to the Boca Resort and Beach Club. Mizner Court is located in Downtown Boca Raton on the grounds of the world-famous Boca Raton Resort & Club. This prestigious location is not only in the center of all the fun and excitement happening in downtown Boca but is also situated directly on the Intracoastal Waterway. Residents of Mizner Court enjoy being within walking distance to some of the area's finest dining, shopping, and entertainment options, as well as just a few minutes from the beautiful Boca Raton beaches. 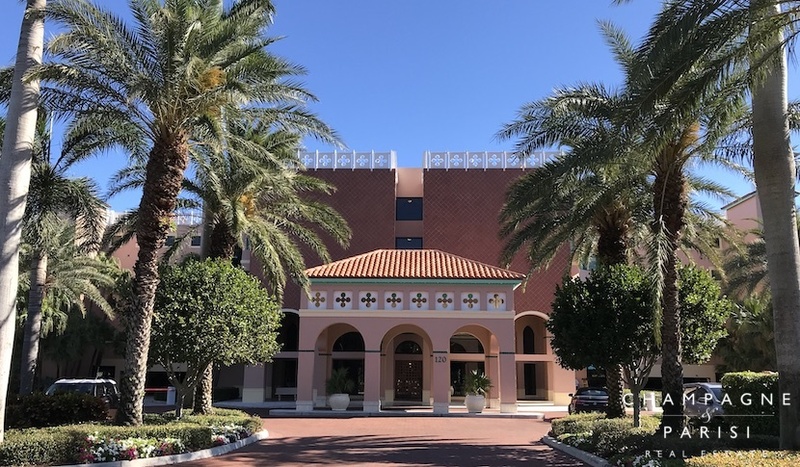 If Mizner Court sounds the perfect place to call home, you may also want to visit other downtown condominiums in Boca Raton, including Tower 155 and Mizner Tower which also offer premier luxury condominium living in the heart of downtown Boca Raton. Contact the Champagne and Parisi luxury condo specialists for more information about Mizner Court. If you are interested in purchasing a condo in Mizner Court or any of the other waterfront condos in Boca Raton, please call us at 561-235-7800. You may also reach us by completing the simple online contact form provided below. We at Champagne & Parisi Real Estate look forward to assisting you in finding your next dream condo in Boca Raton!